Several factors conspired to make Hurricanes Harvey, Irma, and Maria so destructive, and warming temperatures are likely part of the problem. What Made Hurricane Harvey so Deadly? The 2017 Atlantic hurricane season has been extremely active, and deadly. Between Hurricanes Harvey, Irma, and Maria, plus Jose, thousands of structures have been destroyed and many people have been killed, injured, or displaced. Hurricane Harvey's deadly cocktail of wind and moisture hit America's fourth-largest city with a ferocity that Texas has never seen. And while scientists maintain that no single weather event can be attributed to climate change, two centuries of human fossil-fuel burning has altered temperatures just enough to almost certainly make this particular storm worse. "In general, the way to think about it is: climate change has changed the environment that everything is happening in," says Kevin Trenberth, a senior scientist at the National Center for Atmospheric Research in Colorado. "When you add in the climate's natural variability and then the right conditions come along, you can get a storm which is stronger than you might otherwise have expected." In the case of Harvey, which dumped rivers of rain in and around Houston and threatened millions of people with catastrophic flooding (see photos), at least three troubling factors converged. The storm intensified rapidly, it stalled out over one area, and it is dumped record rains for days and days. Here's how scientists explained what brought those ingredients together. Hurricanes tend to weaken as they approach land because they are losing access to the hot, wet ocean air that gives the storms their energy. Harvey's wind speeds, on the other hand, intensified by about 45 miles per hour in the last 24 hours before landfall, according to National Hurricane Center data. While that's not unheard of, the potential for wind speeds to rise rapidly increases under warmer conditions, says Kerry Emanuel, an atmospheric sciences professor at the Massachusetts Institute of Technology, who published groundbreaking research earlier this year on the potential for changes in hurricane wind speeds. "Hurricanes are powered by the evaporation of sea water," Emanuel says. "Water evaporates faster from a hot surface than a cold surface." Emanuel analyzed the evolution of 6,000 simulated storms, comparing how they evolved under historical conditions of the 20th century, with how they could evolve at the end of the 21st century if greenhouse gas emissions keep rising. 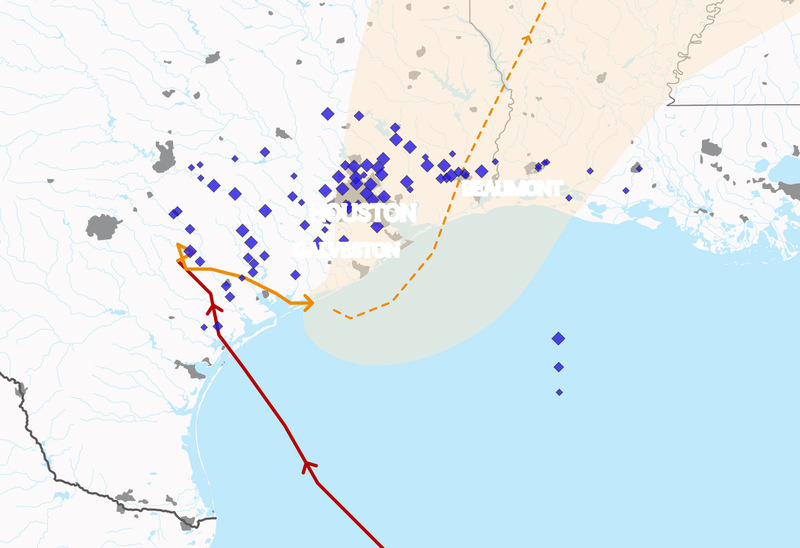 The result: A storm that increases its intensity by 60 knots in the 24 hours before landfall may have been likely to occur once a century in the 1900s. By late in this century, they could come every five to 10 years. Map published at 10 p.m.
Map published at 10 p.m. on August 28, 2017. Scientists have known for decades that the peak intensity of severe storms will likely increase as temperatures rise. But it also is shortening the time it takes to reach those speeds. And late summer temperatures in the Gulf of Mexico now average more than 2 degrees Fahrenheit warmer than they did 30 years ago, says Andreas Prein, with the National Center for Atmospheric Research. "If you want your car to accelerate fast, you put your pedal to the metal," Emanuel says. "If you keep it there, it will go up to the top speed it can go. If you switch from a Volkswagen to a Ferrari, you'll have much faster acceleration and a higher top speed." Other researchers, such as Michael Wehner, a senior staff scientist at the Department of Energy's Lawrence Berkeley National Laboratory, agrees. 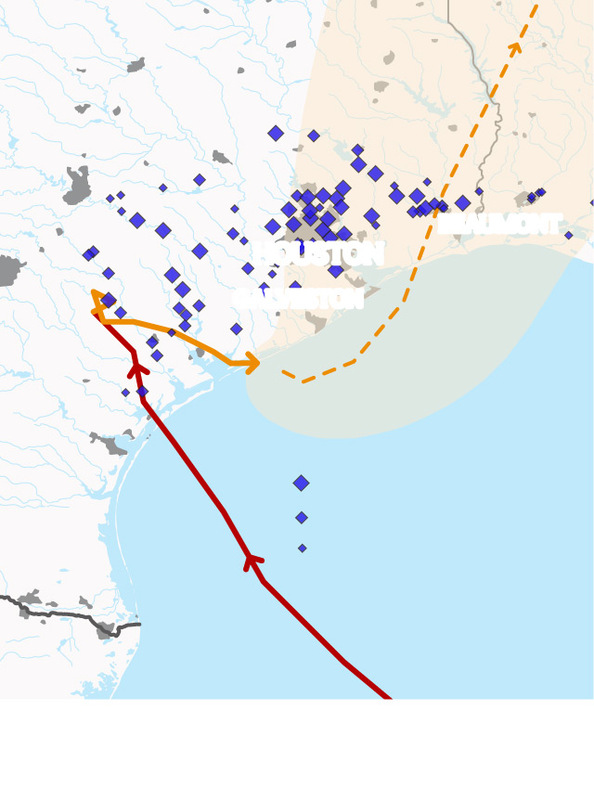 While he points out that many Category 4 and 5 storms experience a late surge of windspeed before landfall, he said he considered it "more likely than not" that climate change contributed to Harvey's last-minute intensification, and "I consider this a conservative attribution statement." The most damaging aspect of Harvey was the incredible amounts of rain it dropped. Some regions saw 40 inches or more of rain in less than a week, making it a potential record for the country. That wetness came from the sea surface and the atmosphere. "Think about an ocean as an infinite supply of moisture," Prein says. "Harvey is sucking it toward land and dumping it on Texas." As the globe warms, rainfall is increasing all across mid-latitude regions. Just as with a hurricane's intensity, the heat built up in the sea surface from climate change allows the storm to take up more water vapor. And since the atmosphere, too, is warmer, its capacity to hold more moisture also increases. Wehner says the "lower bound" of the increase in rain as a result of climate's impact on temperature is at least 10 to 15 percent. "The big story is the precipitation—it's a no-brainer," he says. "Pretty much everything we've done so far has suggested that in this situation, precipitation will be increased. Lots of simulations are being done. In every single one of them, it rains more." Trenberth says that climate change alone can increase rainfall 5 to 10 percent. But if a storm comes at a time when the ocean is also experiencing unusual but natural high temperatures, that could double the increase in rainfall. In fact, it's possible that this combination of climate change and natural variability may drive precipitation up far more than that. "Some experiments suggest that these things can feed back on themselves and increase rainfall even more," he says. In fact, the dry air over land normally helps kill these storms. Harvey, on the other hand, actually pulled in moisture that it dumped on land that was once again evaporating into the atmosphere. The storm was, in a sense, helping feed itself. Of course, the volume of rain wouldn't matter quite so much if the storm just continued moving. But in the case of Harvey, Texans aren't so lucky. The storm pulled to a stop and parked itself over that region. "The critical thing with Harvey is that it's stationary—it's not moving a lot," Prein says. "It's just dumping all this moisture over the same spot." So far, climate scientists say, it doesn't appear that climate change was a significant factor in that stall. It was just bad luck. The winds pushing Harvey around were weak. In addition, two high-pressure systems sitting over the Southwest and North were trying to drive Harvey in opposite directions, essentially keeping the storm from moving northward. Stalled weather systems are often associated with extreme events, Prein says, which can lead to human disasters. It was a factor in the deadly Chicago heat wave in 1995, in which a high-pressure system sat in the same location for days. And it played a role in the Colorado Front Range floods of 2013 and California’s recent drought. It's possible, and even expected by some scientists, that climate change ultimately could drive steering currents to be even weaker. That could potentially compound the effect, allowing storms to stick around even longer. But so far there just isn't any evidence of that. Put another way, Wehner says, "if there is a climate signal, it's one that's so weak we haven't been able to detect it." What he meant was: The circulation patterns that steer storms like Harvey have been weak in recent years, but that change has come on very quickly. That leads scientists to doubt it is connected to climate change. In a Facebook post, climate scientist Michael Mann of Penn State University expanded on that possibility. He agreed that the weak prevailing winds that failed to steer the storm back out to sea allowed it to "spin around and wobble back and forth like a top with no direction." He said that currently a climate connection would be "tenuous," but models predict similar behavior with climate change. This story was first published on August 28 and was updated on September 20.